Sugared cranberries are a thing of beauty. When done correctly, they sparkle and shine as a beautiful garnish, decoration, or snack. When rushed or done poorly, the sugar coating clumps and gets soggy. Find out how to make them correctly using these three tips for how to make stunning sugared cranberries. Have you ever seen a photo of sugared cranberries that makes you think, “Why would anyone use that as a decoration?”. Or, “I was already unsure about cranberries, now I’m definitely not trying them.” What about, “Those look like someone dropped them in the dirt and only kind of decided to wipe them off.” Yeah, me too. Well, my friend, don’t you fret because that doesn’t have to be your experience. Read on for my three easy tips for how to make stunning sugared cranberries. No matter what is being cooked, the main way people try to increase speed is by overcrowding. (Think: too many mushrooms in the pan so they get soggy instead of browning.) The same goes for sugared cranberries. If you work in single layers, you’ll have better control. How exactly do you work in single layers? Always make sure that you can see 100% of the cranberries you are working with at a time. 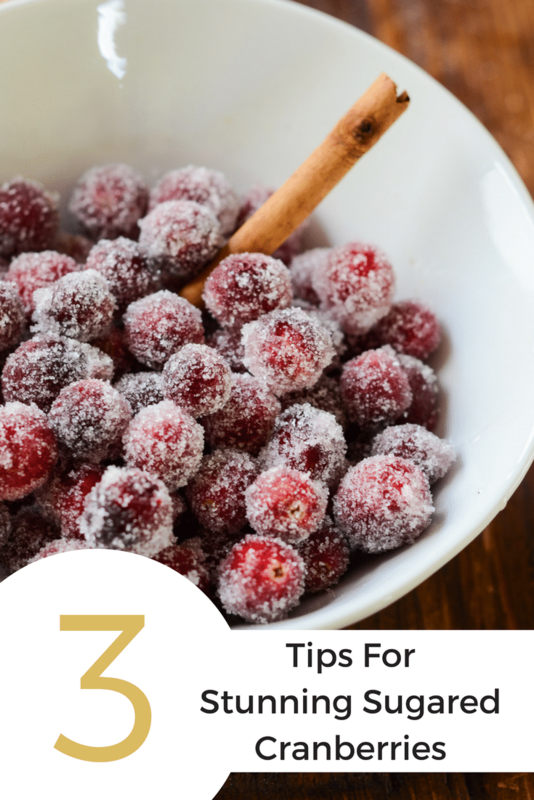 If you put too many cranberries in the pot, it makes it difficult to control temperature and get the right crunch out of your cranberries (Or keep them from getting soggy and limp. Nobody likes limp food.). If you put too many cranberries in the sugar, the sugar gets too wet and clumping is inevitable. If you can always see all of the cranberries, you’ll have much better success. While the first two tips for how to make stunning sugared cranberries are (I think) the most important. This one will go the furthest for helping you if you’re in a time crunch: change out the sugar between every batch of cranberries you do. Think of it like kitty litter; you want it dry and clump-free. For every cup of cranberries, use 1/4 cup of granulated sugar for optimal visual appeal. No matter how well you drip dry your cranberries, there will be moisture lost during sugaring. It could be simple syrup, it could be cranberry juice, either way, it will make your sugar damp. This leaves you one of two options: either work with a smaller amount of sugar and throw away the excess between batches, or sift the sugar before reusing. Either way, this one simple trick will make your sugared cranberries far more beautiful than if you dump them all in the bowl and toss. Trust me on this one, it will make ALL the difference! This one won’t make or break your sugared cranberries, but if you use a fork or something that has as little surface area touching the cranberries as possible, you’ll decrease clumping significantly. Using a spoon or a spatula for tossing is a recipe for lackluster coverage by creating globs instead of an even coating. Sparkling Cinnamon Vanilla Sugared Cranberries (coming soon). Thank you for stopping by, I hope these tips and tricks help you have amazing success! Do you have any favorite tips you’d like to share? I’d love to hear them! Tell me about them in the comments, or show me on social media – @foodabovegold. Don’t forget to tag it #CallMeMichelin and #foodabovegold for everyone to see and a chance to be featured on my Instagram feed!